To the north of Uzbekistan lies the immense country of Kazakhstan. Here a few hot springs can be found, in the mountains bordering Kyrgyzstan and China. However knowing that there are hot springs does not mean that they can be highlighted. 'Springs are sources of healing and spirituality in many cultures, and near Kazakhstan’s hot and cold springs, you can still see ribbons tied to trees, which locals have tied there when they make wishes on the magical waters'. The temperature of major springs constitutes 35-37 degrees centigrade. With regard to water content, temperature and radioactivity the water is similar to Tshaltubo Springs [famous hot spring in Georgia, the country]. The springs have a good influence on people who suffer from rheumatism, metabolic disease, diseases of peripheral system and blood vessels, as well as on the diseases of women and on the people who were poisoned with copper, lead and other metals. Every year Arasan-Kapal Resort accepts around 2000 patients'. 'The resort’s medicinal features include warm springs of lightly mineralized water with silicic acid used for baths'. Somehow some confusion exists as Alma Arasan can also refer to the public baths in Almaty itself. If you want to know more, take a look at the great entry into the Steppe magazine by Rebecca Beardmore. Kapal (not (?) to be confused with Kapal-Arasan) possesses (broken link) a mineral spring with a temperature of 25-28C, not quite soakable? 'A small warm bubbling hot spring, a little ways off-the-path from the road between Karagiye Depression (-132 meters below sea level, 3rd lowest spot on Earth) and Aktau city in Mangystau Province, Republic of Kazakhstan'. 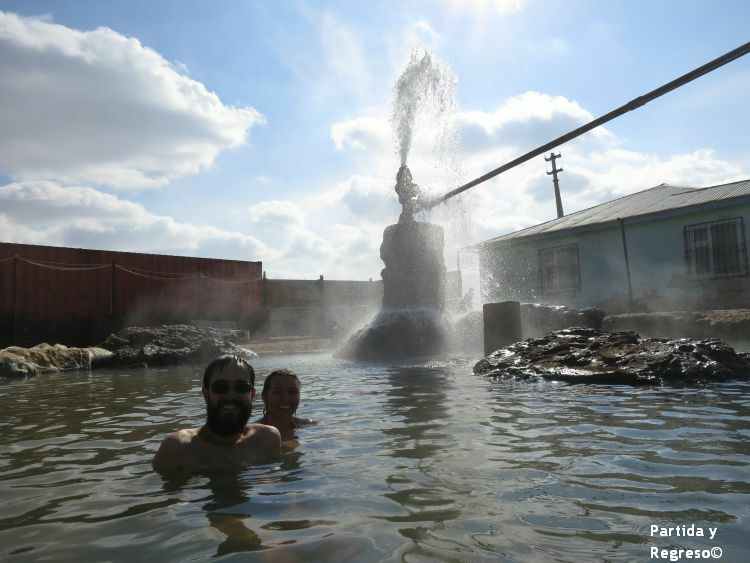 Wikitravel mentions the existence of Radon hot springs ("facilities are very primitive") in the Aktau travel guide with nearby mud baths, possibly the same as above? 'After all of the amazing scenery, I finally got to the hot water spring! Beautiful and well attended spring is extremely hot — 50-60 degrees! It is recommended not to bath more than 15 minutes at a time. Some people take mud bath'. '... and I went to a banya in the middle of the steppe about 30 minutes from Turkestan. The banya is a dome-like structure (called the egg) built over a natural, underground hot spring. We all went into this huge egg and then into our own room which consisted of 2 shower heads and an old bathtub. Basically, you seal up your room and the hot water runs constantly, steaming everything up. You shower like usual and sit in the bathtub of really hot water'. 'Chundzha is located 243 kilometers east and a four-and-a-half-to five-hour drive from Almaty in the Uighur district of the Almaty region. The area is home to a whopping 140 mineral springs'. It names Mirage, Tumar, Derevushka, Omur Su and Premium spa resorts, all located more or less near Chundzha. 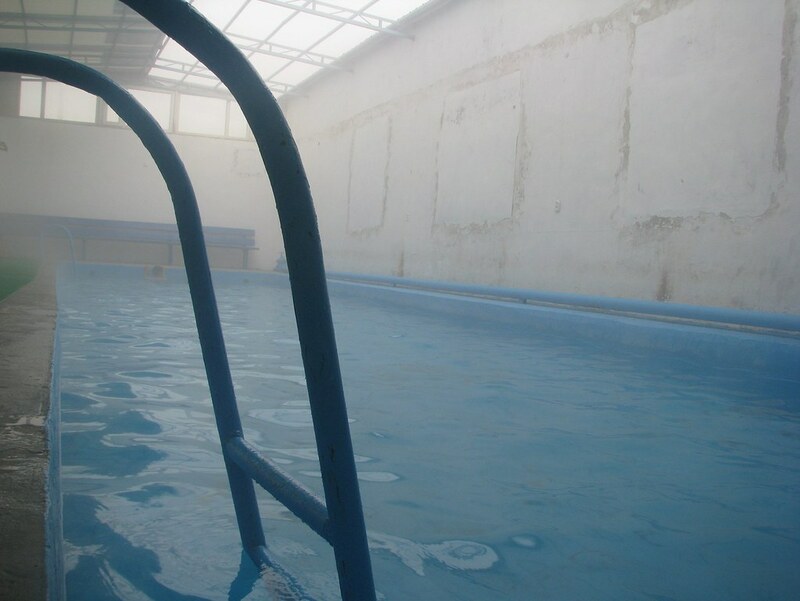 The indoor swimming pool at a Soviet resort in Chundzha in the eastern part of the Almaty Region in Kazakhstan'. The above picture accompanies an article in the Steppe Times by Jonathan Newell. It links to an article which oddly doesn't mention then hot springs themselves. 'Experts say the hot springs at Dobyn village are enriched with minerals and contain small amounts of nitrogen. The waters contain silica and trace elements of radon, providing the thermal springs with unique medical and healing qualities'. It goes on to mention how the wellness industry in Kazakhstan is shaping up. Twenty three health centres have been established since 2000, with 13 under construction, among them a Premium Spa Resort (see above). Two-hundred thousand visits were reported in 2011. There are also mentions made of the following hot springs in Kazakhstan: Tamshaly, Ayak-Kalkan (hot spring 180 km from Almaty, in the village of Baseit), a so-called Mountain Thermal Water Resort. 'The Rakhmanovsky springs are named for the man who discovered them. Legend has it that Rakhmanov, a local hunter, once wounded a Siberian deer and followed it as it ran into a mountain spring.Rakhmanov discovered that the water was warm and steamy as he continued to track the wounded animal in order to finish it off.But as he approved the stag and aimed for a final shot, he witnessed what he thought was a miracle: The nearly fatally wounded animal lying in the hot mineral waters was suddenly healed, rose up and ran away.Rakhmanov was paralyzed by what he had just seen and couldn’t pull the trigger. Since then, locals have called the healing hot springs after the stunned hunter. To this day, despite their remote location, the Rakhmanovsky springs remain popular and many still believe they offer healing benefits such as reducing pain and improving cardiovascular health. The springs are also thought to help spark regeneration and slow aging. The major resort in this area is the Rakhmanovsky Klyuchi Resort, which opened in 1964 and can accommodate 80 people'. Finally, a flickr photo reference to a hot spring in their Kazakhstan set. Have my doubts though.